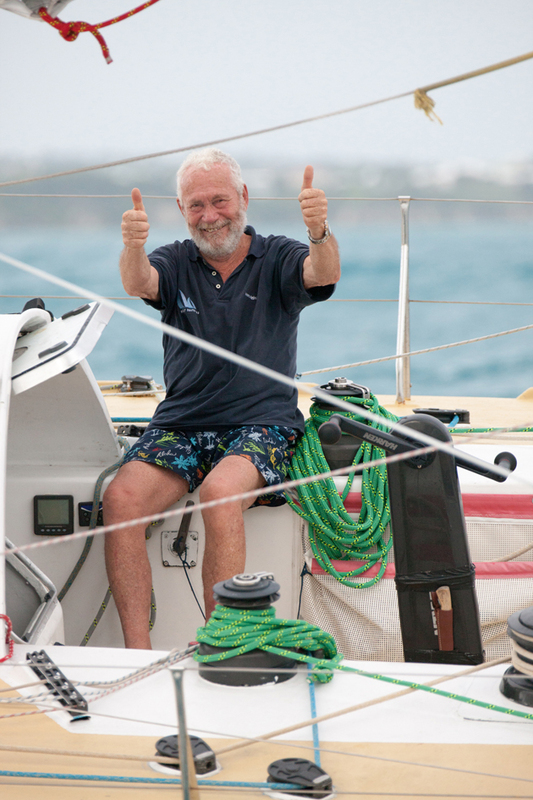 Forty-six years after making history as the first solo non-stop round-the-world sailor, Sir Robin Knox-Johnston is still breaking records. 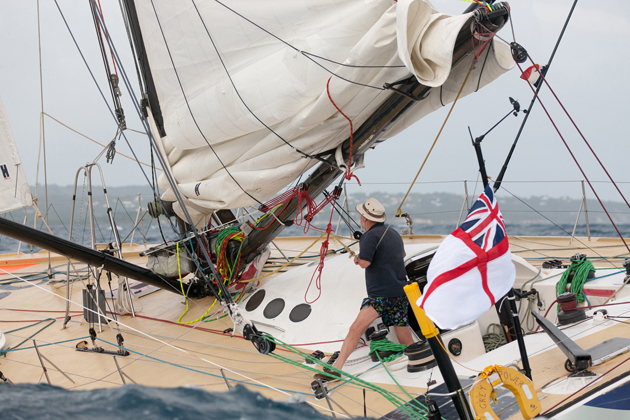 The British adventurer and Clipper Race founder finished the solo Transatlantic race the Route du Rhum – Destination Guadeloupe in third place in the Rhum class. 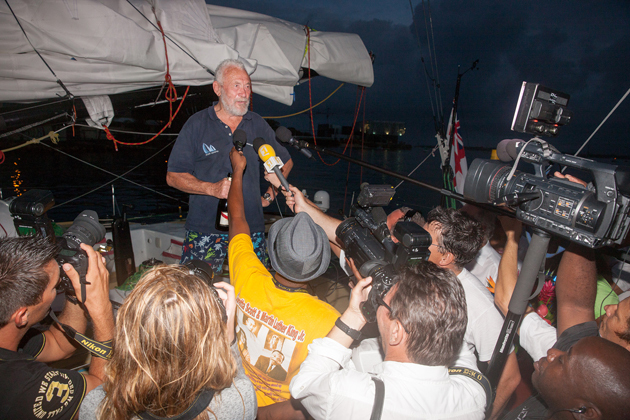 Sir Robin, 75, crossed the finish line on his Open 60 Grey Power at Pointe à Pitre, Guadeloupe, at 4.52pm local time/8.52pm GMT on Saturday after 20 days, 7 hours, 52 minutes and 22 seconds at sea. He was the oldest competitor in the 3,542 French race and said he was happy to finish third after the ‘intense’ contest for the final podium place. ‘I am absolutely over the moon and ecstatic to get third,” he said. ‘I didn’t expect to get on the podium when I started the race. I was up against some damn good competition with lighter, more modern boats than mine that are easier to manage. My boat is a hard boat to work. The top International solo sailors were racing and it was tough. ‘I thoroughly enjoyed it. It was quite fantastic. There were three of us battling for the second and third spot. I got competitive and that was tiring. It came down to boat speed. She’s a fast boat I’ve got. I managed to hold onto my lead but I couldn’t beat Andrea Mura (second) despite catching him up. Despite reporting getting very little sleep, Sir Robin has relished the challenge, enjoying sea water showers: ‘That delicious stream of cold sea water over one’s head is a delight few, outside sailors, would appreciate’ and making the most of a squall by collecting a gallon of fresh water in his mainsail for tea and coffee. 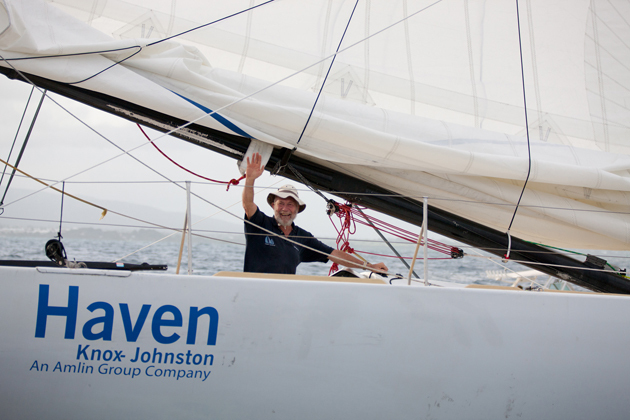 Sir Robin has pledged to be back for the next race in 2018 with a smaller boat.